A 1981 episode of The Lawrence Welk Show called “Backstage with Our Musical Family” promised a behind-the-scenes peek at Welk’s impossibly wholesome cast as they readied for a performance. Despite the title, viewers didn’t see musicians rehearsing, sets being assembled, mistakes, retakes, and frustrated a capella singers—instead they saw more of the same polished songs and dances they saw every week. Welk knew his audience. He knew they wanted to escape even deeper into his chiffon world, a place where everything and everyone wears a veneer of unfettered ease, even in the off-hours. Any simulation of people actually working to create this effect would have been at odds with the Eden that Welk strived to create for his viewers: a place of organic effortlessness and beauty where troubles, backstage or otherwise, are nowhere to be seen. In this way, The Lawrence Welk Show distinguished itself from competing TV variety hours such as The Ed Sullivan Show, which invited in, as a matter of regular programming, the conflicts of the outside world. You couldn’t watch the Doors or the Stones on Sullivan’s show—then or now—without being reminded of the countercultural turmoil that raged beyond the screen. And even variety-­show staples like plate-­spinners and knife-throwers brought with them the tense possibility of unintended spills. Welk’s hour-long world—with its smiling singers, brightly colored sets, color-coordinated male and female outfits, and flawless band ­performances—had none of this stress. His was a sealed-off, accident-free utopia sound-tracked by an endless supply of what the maestro called “champagne ­music.” Once a week, Welk presented viewers with one of the most otherworldly—and most underappreciated—psychedelic chiffon musical paradises ever seen on TV. Until 1965, The Lawrence Welk Show was filmed in black and white. While willfully eccentric in their own way, these earlier shows suffer from a desire to make the performers’ outfits and the sets, which often changed dramatically from song to song, appear, at least by Welk standards, realistic. In one episode, Norma Zimmer wears an elaborate gypsy costume as she sings in front of a beaten-up covered wagon. In another episode, Pat Boone croons “Moody River” before a set full of trees, rolling mists, and dense vegetation. But all of this made for a kind of tired, familiar blandness, the type of sets viewers had seen on many other shows. After the shift to color, Welk abandoned the period-precision costumes, props, and sets, making way for something completely and unnaturally vibrant. Nothing on Welk’s stage was ever worn or moody—or remotely realistic—again. The stylized sets, with their treacly lighting, have the charm and artificiality of a high-school musical done on the cheap. In one show, the same collection of props—a gazebo, a bench, and some potted Dr. Seuss–looking trees—is used in almost every song. Longtime Welk vocal duo Jim and Norma croon “Make Believe” (fantasy was Welk’s mission) in a park created with these props and a single streetlamp. Later, the lamp replaced by a large bus-stop sign, the set becomes—surprise—a bus stop while the four immaculately manicured Lennon Sisters, dressed in powder blue dress coats with white purses and matching gloves, sing “I’m Coming Back to You” in an affectless unison that’s chilling. In another classically Welkian moment, Joe Feeney belts out the American folk classic “Home on the Range” in the melodramatic manner of Irish tenors, Myron ­Floren dashes off polka accordion runs, and both musicians wear not the dusty cowboy denim you might expect, but earth-tone polyester leisure suits. All of this takes place on a budget set likely on loan from Buck and Roy’s Hee Haw. In the eerie hodgepodge typical of the color Welk shows, the American West, Irish sentimentality, and polka ­music comingle with ’70s fashion amid a bunch of shiny plastic props. It seems wrong to call all of this “kitschy”; the combined effect of Welk’s choices is simply too weird. Also, his sensibility lacks the familiarity and the cheap imitation associated with the term. To relate to Welk as kitsch is to cut yourself off from the possibility of experiencing something deliberately otherworldly: many of the performances are nearly psychedelic in the way that they combine an almost jarring combination of colors, costumes, props, and performances into a seamless visual and aural experience. In his remake of “Sing a Song,” the theater is cast in diffuse bands of yellow, red, blue, and green light. Set against this pale, multihued backdrop, musicians wear dark red suits on a cream and olive bandstand, male singers sport light-pink suits, and the female vocalists wear flowing gowns of peach and white. Reviewers often mocked the show as “old-fashioned” and “out-of-date,” but when Welk went color, he fashioned a new universe in which time and history were irrelevant. While Welk’s art is as commercial as possible—and as inoffensive as possible—it also constantly defies formula. The music, especially, is a strange and exotic blend of past and present styles. It sounds a little­ like the big-band swing of the ’40s (minus the drive propelling the jazz of Count Basie or Woody Herman), but the strings, organ, accordion, percussion, and electric guitars make it more Esquivel than Ellington. At times the arrangements veer toward pop music, yet they always stop short of sounding conventionally contemporary. Welk’s take on “Once in Love with Amy” (made famous decades earlier by the Wizard of Oz’s scarecrow, Ray Bolger) mixes a reverb-heavy Fender guitar and a thumpy electric bass with light Mantovani strings and Glenn Miller–esque saxes. The effect is an uncanny hybrid of surf, big band, polka, and easy-listening music. The song pushes this weirdness even further as Welk and audience members dance with “The Bean Queen” and other teenage Michigan Agricultural Queens, all of them guests of the show. Maybe Welk and his arrangers thought these musical choices (and the appearance of Midwestern agro royalty) would have some “now” appeal, and fool the elusive younger audience into overlooking the geritol logo stretching above the bandstand. Welk’s “champagne treat­ment” required that his music possess a sense of order, precision, and, above all, lightness. There isn’t an ounce of “soul” allowed. When singer Sheila Aldridge adds a guttural, bluesy flourish, she’s “given the hook” and pulled offstage. It’s a joke, but the message is clear: deep feeling and contemplation have no place on this stage. The soloist is never lost in her own world, because Welk loathed self-expression, seeing it as an indulgent distraction. “This is easy,” each musician’s face says, “because I am doing it for you.” When Myron (“The Happy Norwegian”) Floren plays a complicated passage, he never looks at the accordion’s keys or closes his eyes in concentration. He always smiles directly into the camera. The viewers know his agile runs require an expert’s dexterity and untold hours of practice, but his face never betrays the slightest strain. The performers seem perfectly satisfied to be smiling decorations in Welk’s parade of style. Pianist Jo Ann Castle takes Floren’s mannered nonchalance in a different direction, smiling and laughing to a degree that borders on the maniacal as she plays full keyboard glissandos (the kind immortalized by her friend Liberace) while wearing a sequined ball gown and boa that, miraculously, never interfere with her performance. Still, the excess of Castle’s pyrotechnics is tempered by Welk’s culture of restraint: songs last around three minutes, solos are short and kept to a minimum, and the melody is always strictly followed. Welk rejected the freedom, exploration, and interpretation essential to jazz. If a Welk musician adds some “personal touches,” they always fit into the spaces left by the melody: the audience must always be able to hum along. The listening must be as effortless as the performances. One of the stranger “personal touches” is a gesture sometimes used by the trumpeters and saxophonists. During the introduction to “This Love of Mine Goes On and On,” Johnny Zell moves his fingers back and forth on the trumpet’s valves more than necessary to create vibrato, as if he’s winking into the camera and giving each viewer a little something extra. And when Welk’s sax players use the motion, it has no effect at all—it’s bogus, purely affected for the audience. Like Zell, all of Welk’s horn players use a fast vibrato that’s repulsive to most jazz musicians, who prefer a slower, more natural waver. This kind of vibrato and the gesture that adorns it represent what some have found offensive about Welk’s World: it’s unnatural and cloyingly sentimental. But what Welk wanted, and what he achieved, was a surface without much substance to get in the way—a constant stream of gestures, colors, smiles, and nimbly performed escapist pop that floats across the bandstand, through the TV, and into living rooms. 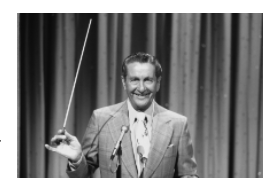 The post–Lawrence Welk show (he died in 1992), performed live at the Welk Resort Center and Champagne Theatre in Branson, Missouri (the capital of American kitsch), is regrettably drained of much of Welk’s thrilling stylishness. Often draped in nostalgia and patriotic platitudes, the Branson shows sometimes appear more like a Republican Party rally than a musical variety show. The contrast makes clear how strange and pure (and strangely pure, and purely strange) the old show’s aesthetics were. There were no messages delivered. There were no politically tinged values espoused. Even songs that could be politically charged are performed in a way that guarantees any such interpretation is obscured by lightness. The Dale-introduced episode opens with “This Land Is Your Land,” played in the “champagne” style, the song’s folk roots replaced by a light two-beat feel more suited to a ballroom dance than a protest-rally sing-along. The show ends with “America the Beautiful,” but Welk’s visuals override the message of the lyrics: the singers wear outlandish outfits, the atypically patriotic colors of green, purple, and silver sparkling on their vests as they sway from side to side. The only thing truly American about this performance is its love of glitter and excess. Welk sometimes paid lip service to the ideals of home and country as he introduced a song or a week’s theme, but these ideals were never the show’s main concern. Welk’s World was a carefully crafted and stylish alternative to everyday life, synthesizing a strange blend of super-­slick music and shimmering visuals into a highly stylized aesthetic antidote—an antidote best symbolized by the references to champagne that framed each week’s show, which opened with a cascade of ­bubbles and the sound of a popping cork, and closed with Welk’s trademark phrase “Champagne Wishes and Caviar Dreams.” As long as you were watching Lawrence, it was forever New Year’s Eve. Ken Parille teaches at East Carolina University. He is the author of 50 Essential Guitar Lessons, the forthcoming Boys at Home: Discipline, Masculinity, and “The Boy-Problem” in Nineteenth-Century American Literature, and numerous essays on comics and cartooning.